ORDING TO GERRY Coyne, there are four keys to running a successful pub. If you have all those four together, then you’re onto a winner. And indeed Gerry Coyne is onto a winner. 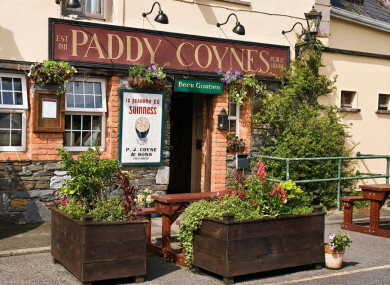 He runs Paddy Coyne’s, a pub located in the village of Tullycross in the heart of the Renvyle Peninsula in Connemara, Co Galway. The pub itself dates back to 1811 and has been in the Coyne family for several generations. Coyne himself has been at the helm of the operation for a period he jokingly describes as “too long”. Like many country pubs of its ilk, it once served as a one-stop shop for groceries, pints and, yes, funerals. For many years, the pub doubled up as an undertakers. The Coyne family continues to run an undertaker business, but it is now a separate entity. With over two hundred years of history in its back pocket, Paddy Coyne’s is filled with notable trinkets and artefacts. For one thing, they were ticket agents for White Star Line and Cunard Line meaning there are little nods to both businesses dotted around the pub. It’s the kind of pub you could wander around for hours, says Coyne. It’s a homely pub and known for its quality grub and has picked up accolades for its food offering. The menu consists of local favourites like mussels and Connemara lamb. “Ninety nine per cent of our produce is local,” says Coyne. Our food offering is good and we always keep it fresh and simple. We’re a pub that does food but we’re a pub that does food well. Paddy Coyne’s also holds the distinction of being home to its very own theatre with local drama group Curlew Theatre Company staging performances there each summer. “It’s a small theatre but it’s different and people love it,” says Coyne. Over the years, the pub has welcomed luminaries like Fred Astaire, John Wayne and Maureen O’Hara through its doors. “Just normal people like anybody else,” he says. A few years ago, the RTE television series Single-Handed was filmed there. A grave used in the show has been erected at the back of the pub for posterity. The pub welcomes everyone from locals to overseas tourists. They also have a strong repeat trade. It’s the type of pub that if you visit once, you’ll likely seek it out again. It’s the warmth and friendly chats and the sense that anyone could walk through the door that keeps them coming back, he says. It’s the kind of pub where anything can happen at any time. It doesn’t happen because you want it to happen. It happens because it happens. Email “'Anything can happen at any time': The secret ingredient of 200-year-old Paddy Coyne's in Connemara”. Feedback on “'Anything can happen at any time': The secret ingredient of 200-year-old Paddy Coyne's in Connemara”.